Below are some examples, and at bottom are tips on creating a successful author event. If you need a speaker, get in touch. I’ll work with you directly (no speaker’s agent). I’ve made keynote speeches for national conferences to rural electrical coops. I’ve dedicated new libraries, and recently gave the commencement address at Bemidji State University and University of Minnesota, Morris. I show how a novel or short story is adapted to film or another art form. I share my experiences working with Hollywood producers on a CBS television movie, and also my recent successful indie film Sweet Land–which now has new life as a fully staged musical. 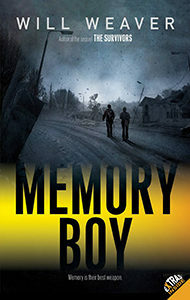 As well, my young adult novel Memory Boy was produced for opera by the Minnesota Opera. It’s fun talking about those adaptations. I cover the general process of writing and publishing a novel. This includes a step-by-step look at the stages a novel goes through: plot idea, research, rough draft chapters, submitting to an agent, revision (revision, revision! ), book contracts, copy editing, book arts (cover and book design), reviews, book launch, etc. Along the way, we look at the techniques of really good fiction—the can’t-stop-reading kind of prose you need in order to be competitive in the publishing world. Your students have all read one of my novels or short stories, and I come to your school. It’s the students’ chance to ask the author anything: what they didn’t like or understand about the writing, “where my ideas came from,” etc. Along the way I make the point that writing is a process, not a miracle. I also try to intersect with what what teachers have been working on in class. My goal? Empower kids to keep reading, plus leave them feeling more confident about writing. This is a great program whereby a community chooses a single book, gets everybody to read it, then brings in the author. I’ve done several of these. They take a lot of planning and organizing, but they always turn out well. It’s a great way to bring your community together. Your school chooses one of my novels. I arrange for a book discount directly from my publisher, and then everyone at your school (including administrators and custodians!) reads the book. Then we gear up for a meet-the-author, ask-him-anything day at your school. One of my goals has been to keep young men reading, with books that will catch and hold their attention. Contact me through this website, or Facebook or Twitter. Let me know your school or organization’s needs. Whatever it is, I’ve probably done it. Early on we should talk about my author fee. Make me an offer, or I can, if you like. I’m happy to list what honoraria I’ve been paid recently; you can see whether you’re in the ballpark. If you’re short on funds, considering pairing with another organization. Once we agree on a fee, we’re good to go. Time to start coordinating with other teachers or media specialists, and setting the schedule. Your goal is the get your money’s worth from my visit. In terms of workload, I like no more than three contact hours in a school setting per day, though on occasion I have done more. A typical arrangement is an afternoon in a school, then a public library event in the evening. Or, 3-4 sessions in a school day, along with lunch with teachers, meet with the student writers’ club, etc. All schools and communities are different. I’m flexible. Stay in close touch with me about the details of the trip. Would you like me to prep the students or readers ahead of time via email or Skype? Where are the event’s books coming from–a local bookseller or direct from the publisher? I can help with the latter. Will there be book sales after the event? Who will handle that? I seldom bring books to sell because your local indie bookstore needs all the help we can give it. I’m also happy to sign books and chat so long as someone handles the book sales. Intersect with your local media. Your hometown newspaper, radio, or television affiliate will be happy to publicize the event, but you have to contact them. Remember: your goal is to get the most value from my visit, which includes publicity for your school, library, or organization. Send me a specific itinerary with dates, names, phone numbers, directions to the school (imagine you’re a travel agent). Also, be sure to test your tech equipment and make sure someone is on hand to run it for the day of the event. Do you have decent audio speakers? Those are often overlooked. Relax! Enjoy your hard work in making this event happen. I’m on duty, I like what I’m doing, and I’m good at it. My goal is to meet as many people (students, administrators, community members) as possible, to confirm to them that your school or library is a happening place– full of good ideas like this one. “Great commencement address! Superior! 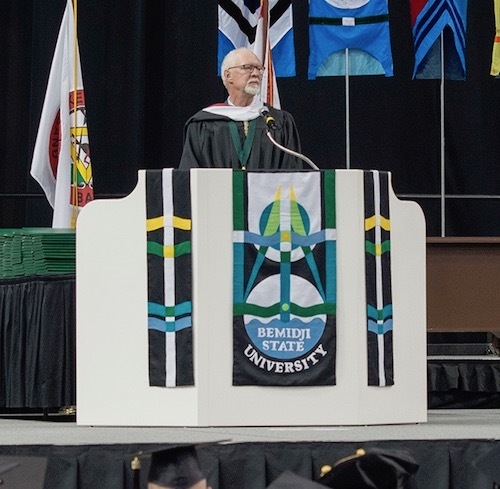 Loved the spirit you brought to graduation day at Bemidji State.” Laura L (Speech Professional. “Thanks so much for keynoting our 2016 ARSL Conference in Fargo. You were a big hit with the attendees–the surveys were so positive about your humor and your stories.” Vicki Bartz. ARSL (National Association of Rural and Small Libraries). “We thoroughly enjoyed your school visit. Afterward, I had kids who normally don’t care about reading come to the library and take a book home to read.” D. Musland. Principal, LaMoure School. LaMoure, North Dakota.